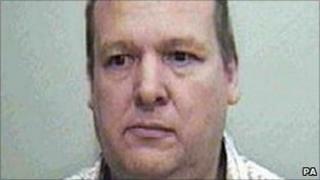 A man who murdered a teenage girl in 1983 has died after being found unconscious in his cell. Paul Stewart Hutchinson, 51, of Gamston, was serving a minimum of 25 years for the murder of Colette Aram, 16, in Keyworth, Nottinghamshire. He pleaded guilty at Nottingham Crown Court last December after DNA evidence linked him to the crime. He was found unconscious in his cell at HMP Nottingham at about 0800 BST on Sunday. He died on the way to hospital. A Prison Service spokesperson said: "Paramedics were called and tried to resuscitate him but he died at 9.58am while being taken to hospital in an ambulance. Colette's disappearance was the first case to be featured on the BBC's Crimewatch programme. Hutchinson raped and strangled Colette before dumping her naked body in a field near her Keyworth home. He was interviewed as part of the original investigation but was only arrested after a DNA profile produced from evidence at the scene was linked to a family member on the national database. When he was arrested, he tried to blame his brother Gerhard, who died in January 2008, until police found a DNA sample ruling Gerhard out. Eventually he confessed to fellow prison inmates as he was awaiting trial. Nottinghamshire Police said it was preparing a file for the coroner and awaiting results of a post-mortem examination.